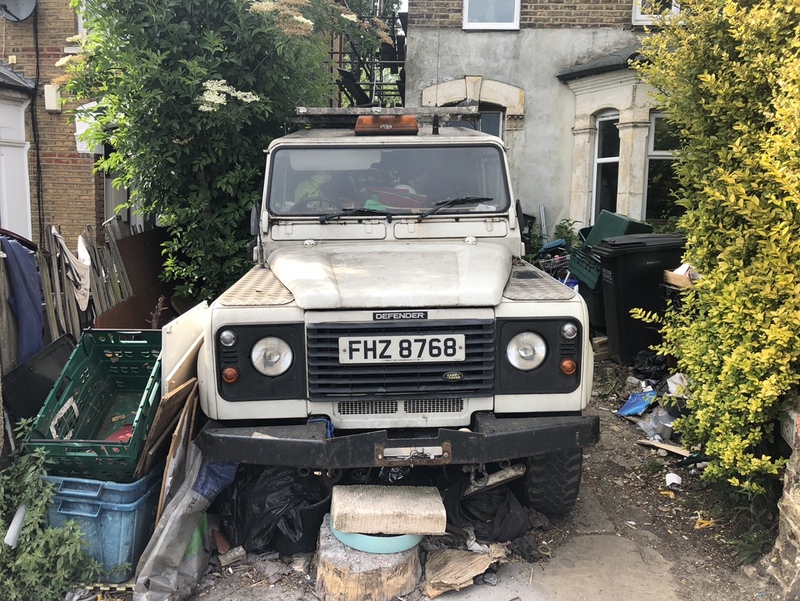 2004 Land Rover defender ex utilities vehicle...worth buying? 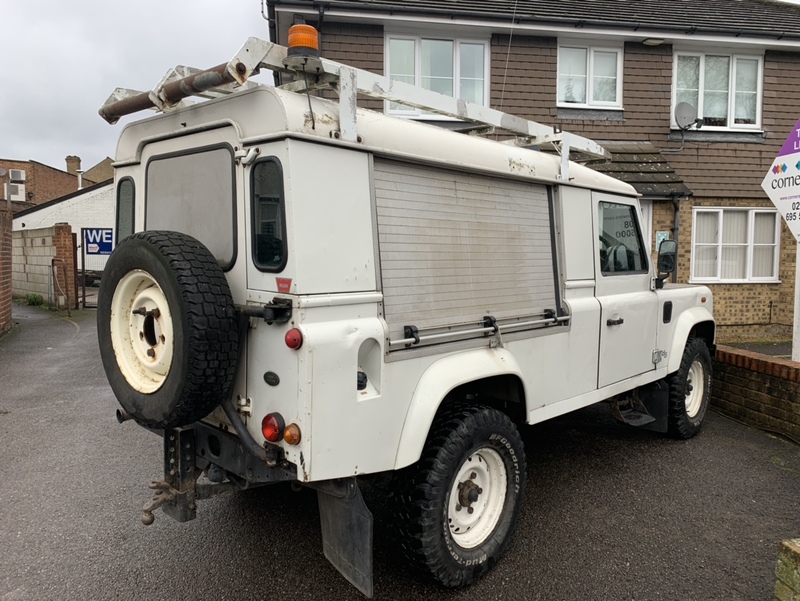 Thread: 2004 Land Rover defender ex utilities vehicle...worth buying? One word I'll mention 3 times.....CHASSIS, CHASSIS, CHASSIS. If the chassis is solid everything else is just nuts and bolts and leads me to say.....it's a deal it's a steal, it's the sale of the f**ing century! Edit....yes I'd say its ex utility company, probably electric company. 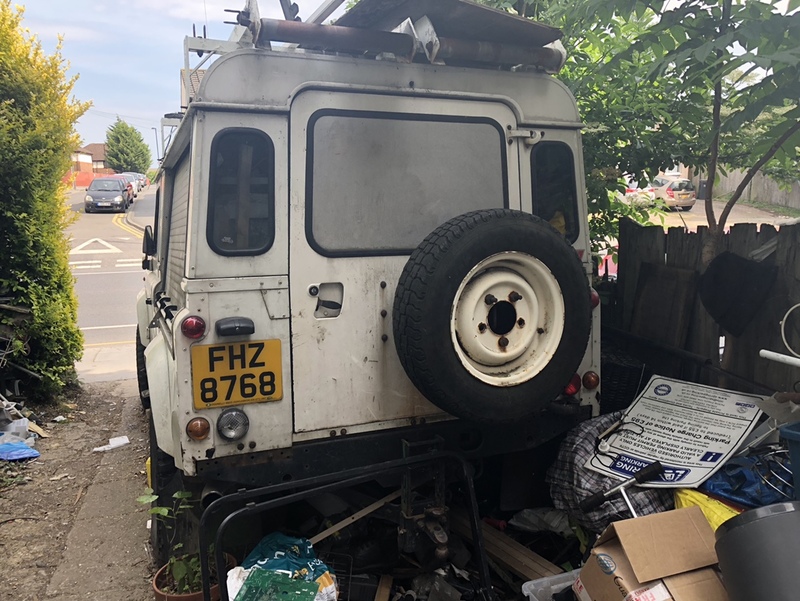 its got a winch bumper which has been removed. Also difficult to tell from your pics but it doesn't seem to have the rot in he usual places which is also a bonus. Last edited by Franky Four Fingers; 5th February 2019 at 20:45. Looking at the state of the joint, the Lanny might also be a sh!tbox too ?? Ha ha, thanks for the quick response! May sound silly, but what exactly am I looking for with the chassis? 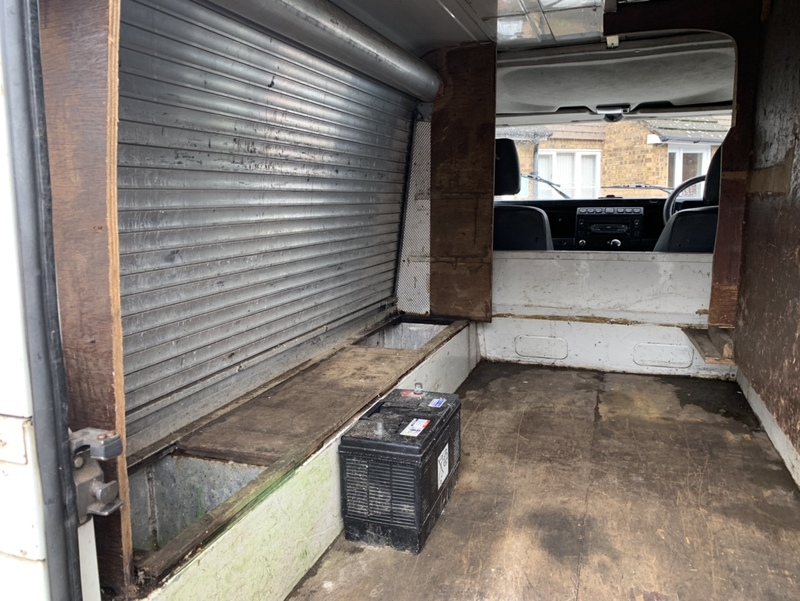 Although it’s been sat for a year, I’ve had a visual look around it and it doesn’t look too bad (although I haven’t looked underneath). Am I right in thinking I have to get underneath and look for rust? Ha ha. The old boy is actually a multi millionaire who owns vast amounts of commercial land but is somewhat of an eccentric. (And a hoarder). I agree he needs to clean up the house and front garden! He must be knocking on for 80 but is still buying land etc. Interesting character! I’ll take it if you dont want it! MOT history shows nothing failed on the chassis, these tend to be very well maintained under contract. Bit of a van esp. with the weirdo sliding-door storage boxes but you can play around and fit windows etc in due course. Yes basically that. Look for the lowest sections where they drop that's a normal plcae. Sorry to stay you need to don your overall and get dirty..... might as well get yourself ready for that. Get right underneath and have a poke around the entire chassis. A mate of mine's into them, so I`ve picked up a thing or two. 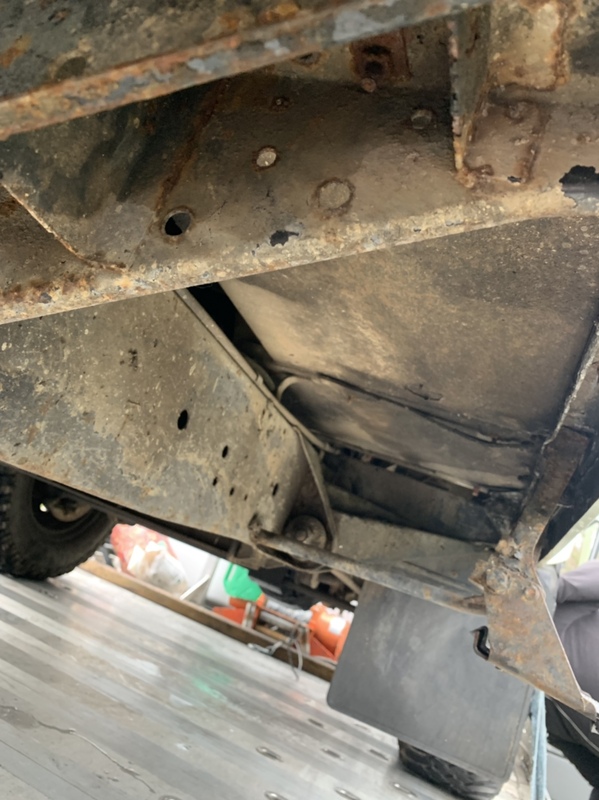 As already stated, the condition of the chassis has a major influence on the value, they rot out at the back so it's fairly easy to check how bad it is. They're big heavy things to work on, don`t overlook that. It's not like working on a small car! Having said that' they're fairly simple beasts. 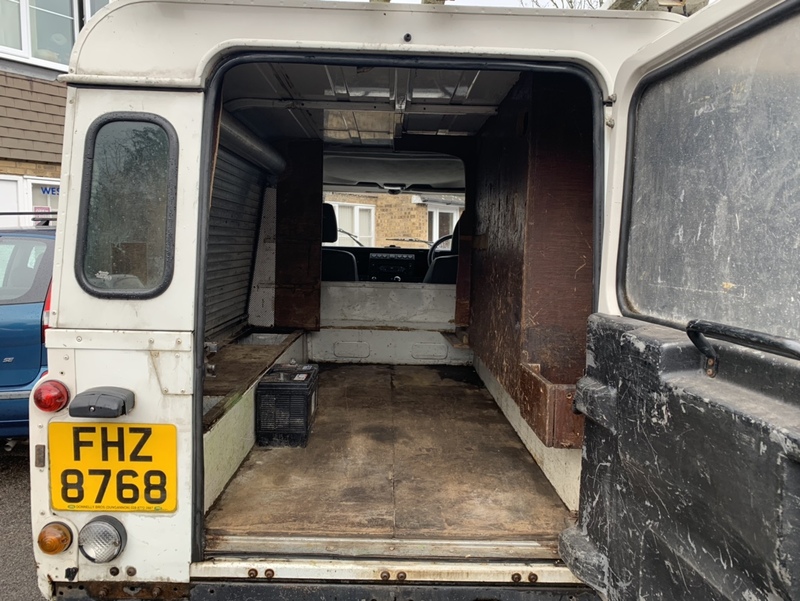 If the chassis's good enough to pass an MOT it might be worth buying, do the minimum to get it MOT'd and roadworthy, then punt it downfield for a profit. If you start trying to restore it you could end up with a moneypit. Thanks fellas, I’m going to pop up there tomorrow and have a good look underneath. Quite excited to get my hands on this to be honest. My knowledge and skills extend to cleaning and tidying her up. Unfortunately I’m not the best mechanic. If I can get her through an MOT and maybe use her for 6/12 months and sell her on I may just do that. Another iconic car I can tick off the list of owning! As well as chassis chassis chassis, think bulkhead bulkhead bulkhead as well. Plenty of advice to check chassis, make sure you prod and push inside and tops of the chassis, especially at rear. Another area to watch is the bottom of the A-Posts. 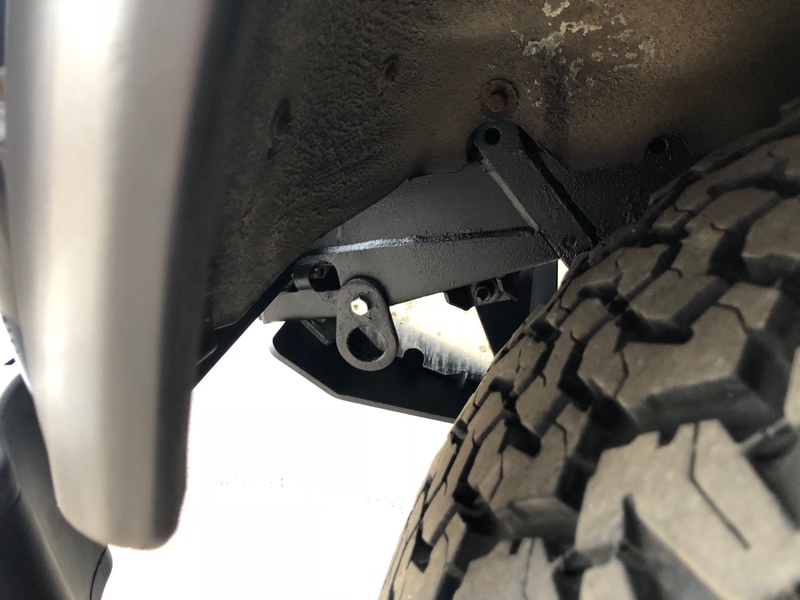 The bottom of the post is where the bulkhead mounts to the chassis outriggers. Have a good look at the bit beneath that drivers side windscreen hinge. I can’t zoom in close enough but it looks iffy. The main chassis should withstand you smacking it with a hammer or big screwdriver, so do that. The small outriggers tend to collect crap inside then rot from the inside out. So give them a good prod too - though they can be replaced. 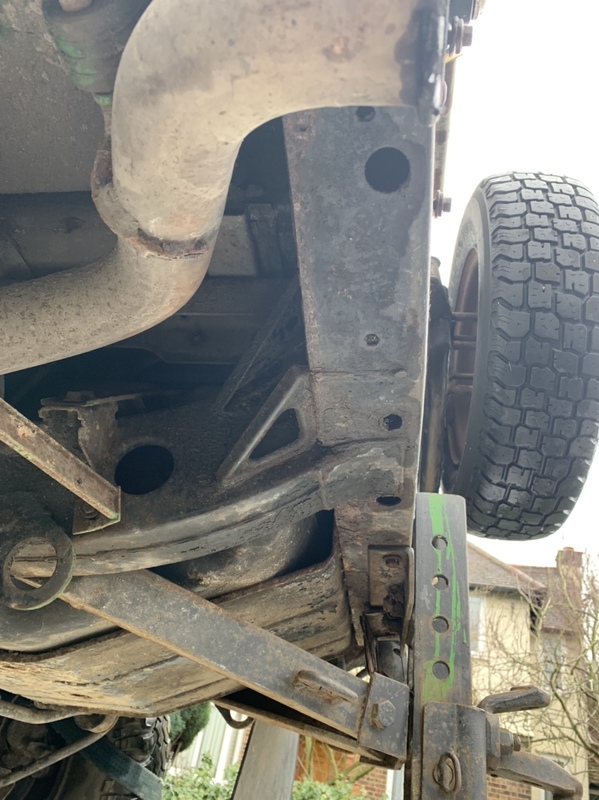 The rear crossmember catches crud thrown up by the back wheels so get your hands where the landless have been removed from and see what it’s like. 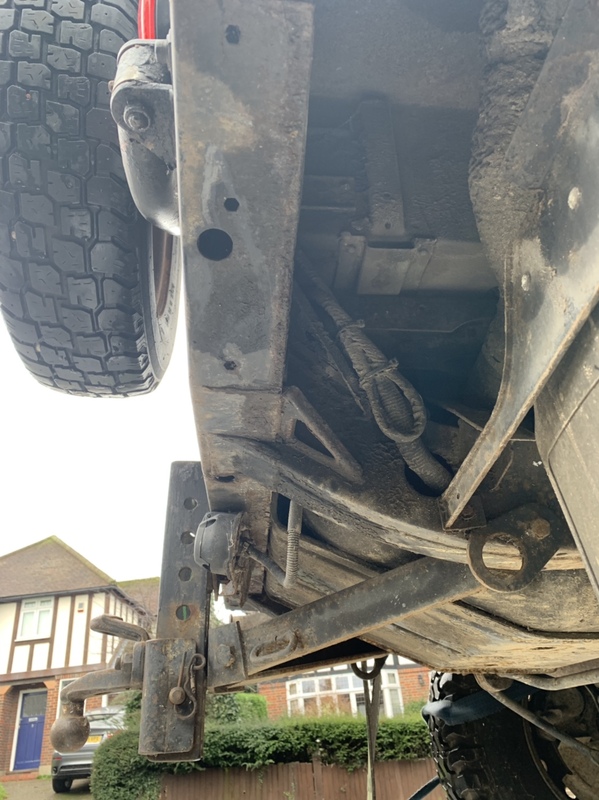 The crossmember can be replaced fairly easily by a competent welder but it’s a few hundred quid. What engine has it got? Check the front swivels Too. Badly pitted need replacing or the oil leakes out of them. Any sign of oil down the inside of the front wheel will alert you to this. Top advice everyone, much appreciated. Hopefully popping back tomorrow so will have a good long look around it. Hoping to get this old girl back on the road asap and clean her up a bit! Be sure the ratio of enthusiasm: capability/resource is balanced in your favour before committing! A good aul N.Ireland reg...I’m guessing mountain rescue or N.I.Electricity. I don’t recall any other sevice being that colour. So I managed to get her home today...not without any issues! Franky four fingers has been an absolute star with help/advice. Want to say a big thanks to the TZ community. So many generous people on here...managed to get a pic of her whilst taking her through the local car wash to give her a quick bath. Drove surprisingly well at first, until the loss of power and lots of smoke. Hey ho, I reckon I might have to get used to this malarkey! Looks great! Depending on where in the country you are, I’d be taking it straight to FFF’s garage for a once over. Alternatively, if you are near Manchester, the mechanic I use is also very familiar with old LRs. Wonderful, wonderful! I'm really glad you've saved it from fading away. Perhaps it's not practical for your purpose, but I like the sliding doors... Somehow it suits the utility character of the vehicle. I wish you many happy and safe miles with this wonderful machine. I'm really interested to see the interior, especially the adapted rear half of the car! Last edited by thieuster; 10th February 2019 at 00:00. They're disappearing like hot cakes in our parts. One a week stolen and never recovered. Half expect to come out some morning and find mine gone. The old girl has scrubbed up nicely. Looks a good find considering how the prices have gone through the roof lately. Have you got any security devices to fit when you leave it parked up? Last edited by sish101; 10th February 2019 at 14:00. Many thanks for all the comments guys. I will look at some security once I manage to sort the engine etc. I’m on route to pick a battery up and see if I can get her going so will take some more photos for Menno and anyone else who is interested in this old girl..
She's scrubbed up quite well! I echo the other comments about taking the necessary security precautions. 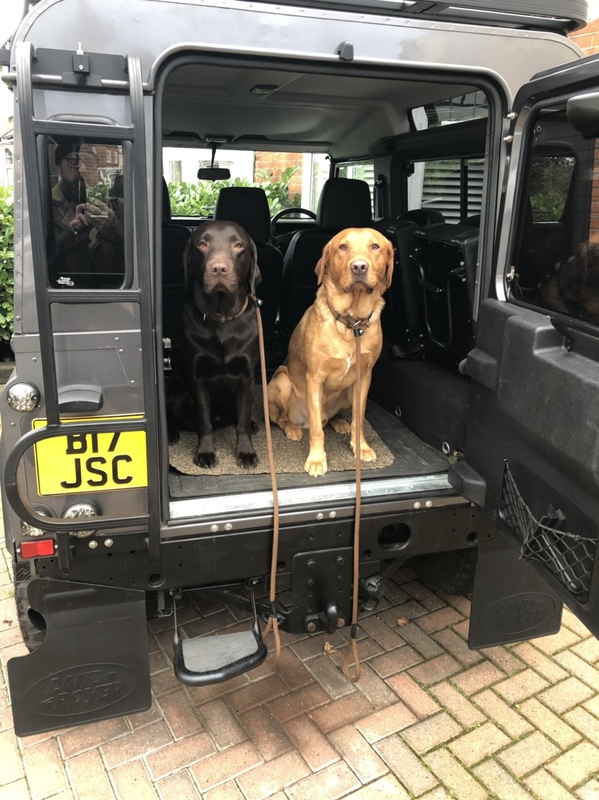 I'm aware of a number instances where just the bonnets have been stolen from Defenders in recent months. Seems to be some rusting in places underneath but nothing too bad. I couldn’t see any holes or serious deterioration. If it lasted a couple of years and was sold for spares and repairs I’d be happy! The coffee and pizza conversions have got me thinking! The corrosion I can see looks like omega 3 to me and nothing to worry about. 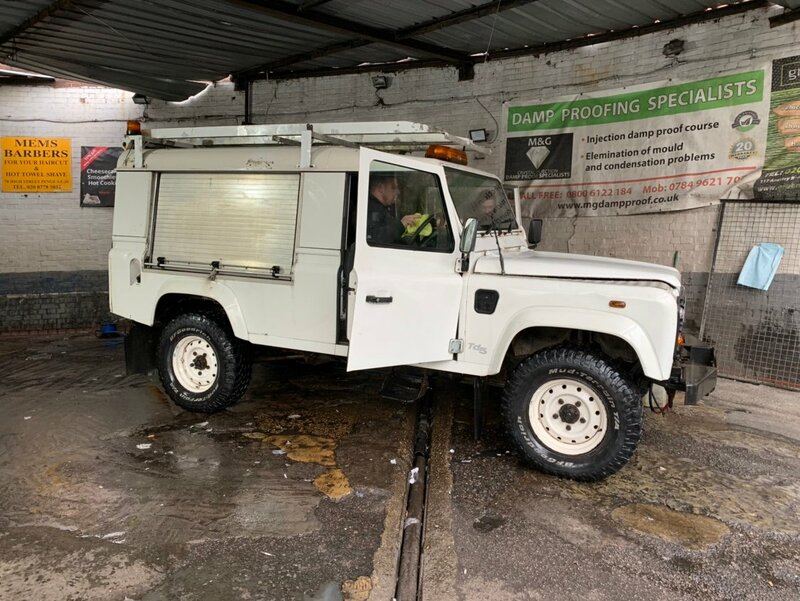 Great looking Landy, would be ideal for a mobile mechanic or large estate handyman. Also popular in these parts with tree surgeons towing a woodchopping trailer. Would sell in an instant if tidied a bit I reckon. Cookingn and serving them pizza on your knees inside the van-part... You'll need to raise the roof. Last edited by thieuster; 10th February 2019 at 16:52. Chassis looks in half decent nick to me, hopefully you'll get away with a few repairs here and there. 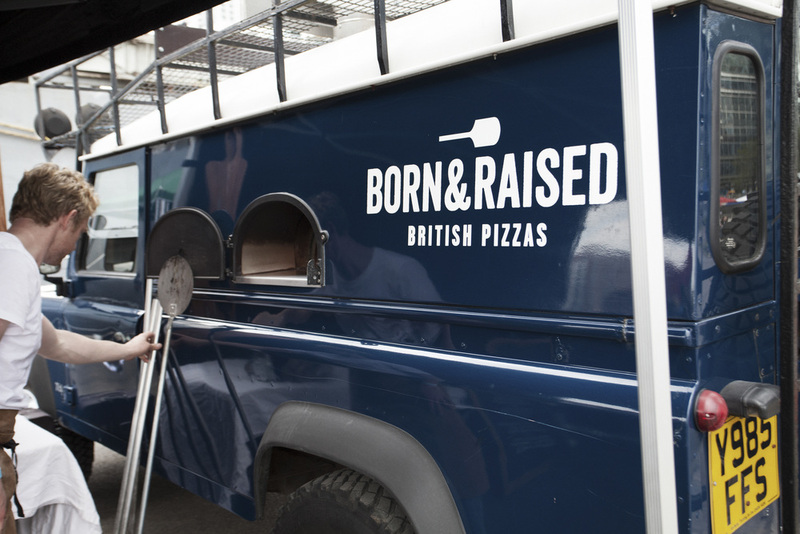 The roller sides are interesting but what you need is a Roccbox near the cab end and you'll be firing pizzas out at your local festival and paying for the truck. Is the passenger roller door just into a closed "cupboard"? Not entirely sure how you would use that but it's part of the fun! I believe that originally both roller shutters opened into shelving units. 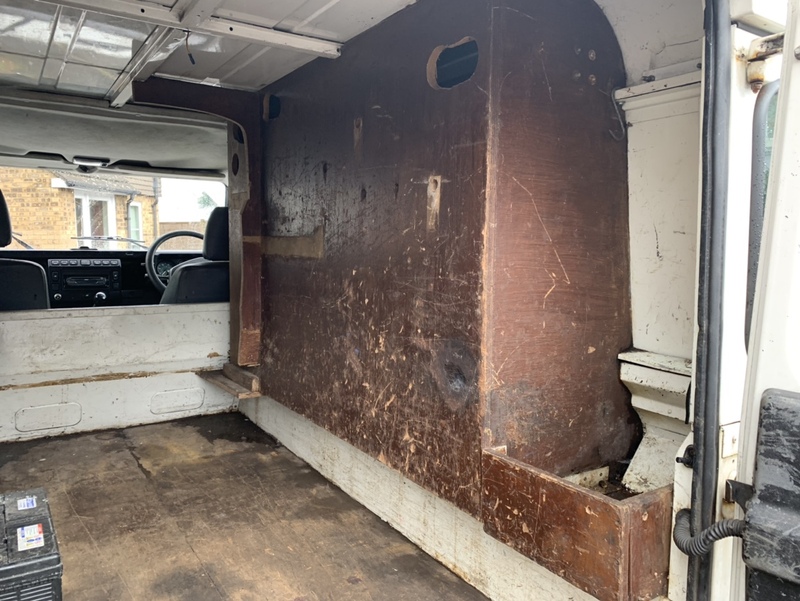 One side has had the shelving removed and il probably remove the other side as well. 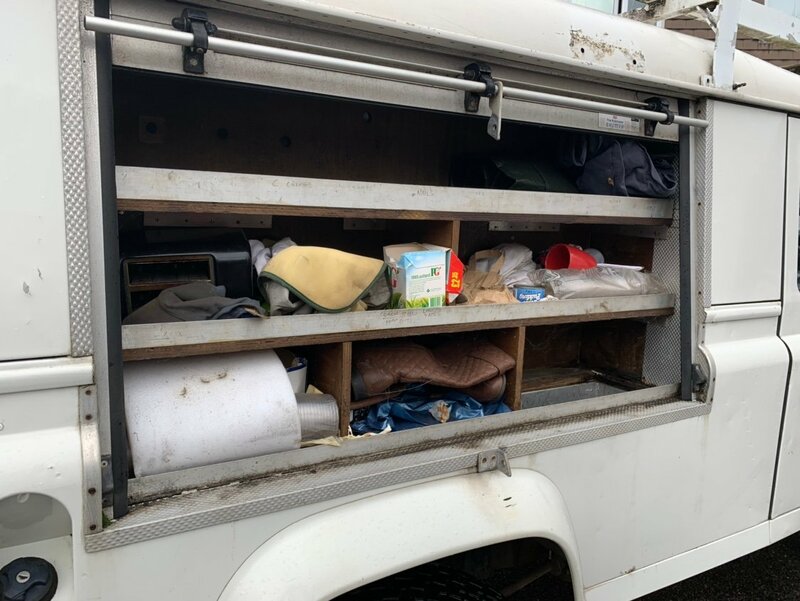 This will then make the shutters open straight into the load area at the back of the truck. 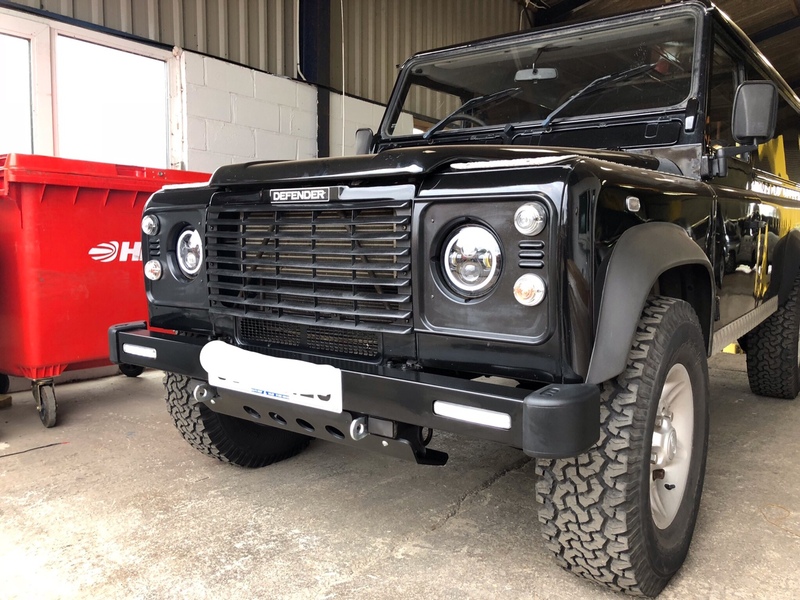 Once the engine is running ok and I know the truck is sound, I’m planning on losing the roof rack and orange beacons and swapping the front winch bumper for a straight bumper and streamlining her. I’d like to lose the roller shutters if possible and replace with either a body or glass. The shutters rattle when driving and make an awful din! This is one of the original shelving units with the previous owners contents still inside! Mine’s the same age! As mentioned, if chassis and bulkheads are ok, the rest is just cosmetic. Mine’s the same age! As mentioned, if chassis and bulkheads are ok, the rest of just cosmetic. 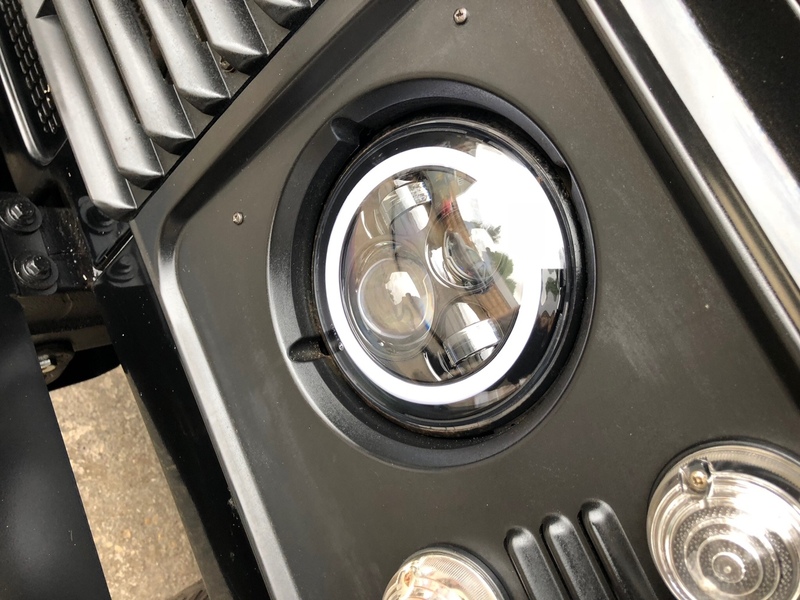 This is an example of what we were talking about the other night- Chinnocks looks fantastic with the grill, LED lamps and front bumper mod. All not mega bucks and brings the car conservatively in to the 21 century. Last edited by Franky Four Fingers; 10th February 2019 at 20:45. Is that the cars original paint or have you had it resprayed? What a lovely looking vehicle! I am super excited now! The way they usually work is the pizza oven sits in the back as a standalone thing. Food is sold and saved via a table/counter to the front/side. Fairly certain it's standard however I stand to be corrected. Edit.....not sure of the actual colour (Corris) but wasn't that the original Tomb Raider Grey? Last edited by Franky Four Fingers; 10th February 2019 at 21:03. 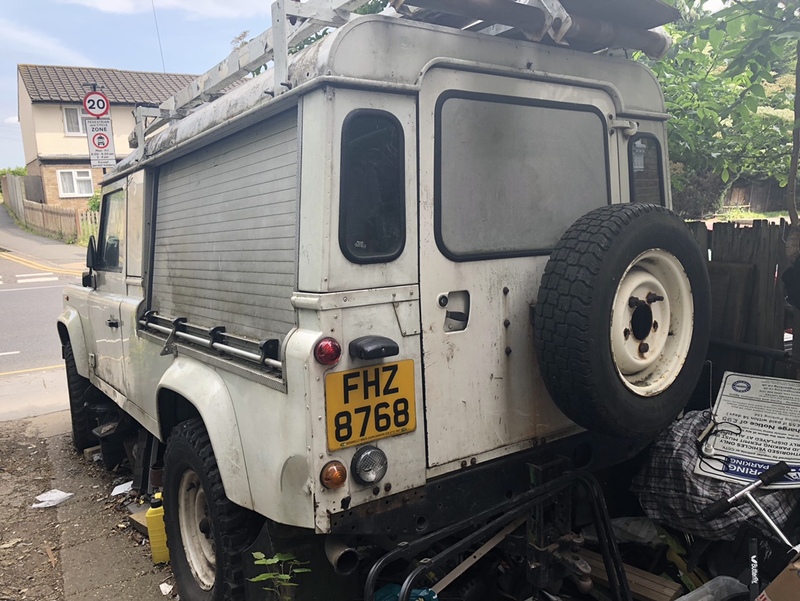 I went out to buy a Mini Metro for my wife over 20 years ago and came back with an ex coastguard SWB series 3 ..... 20 plus years later and several Landrovers later & you thought watch addiction was bad ... these land rovers get into your blood , not to mention your wallet ! But you are here for a good time, not a long time , so enjoy it . The plus side is , my kids ( now grown up and married ) also my wife have been infected and love them. 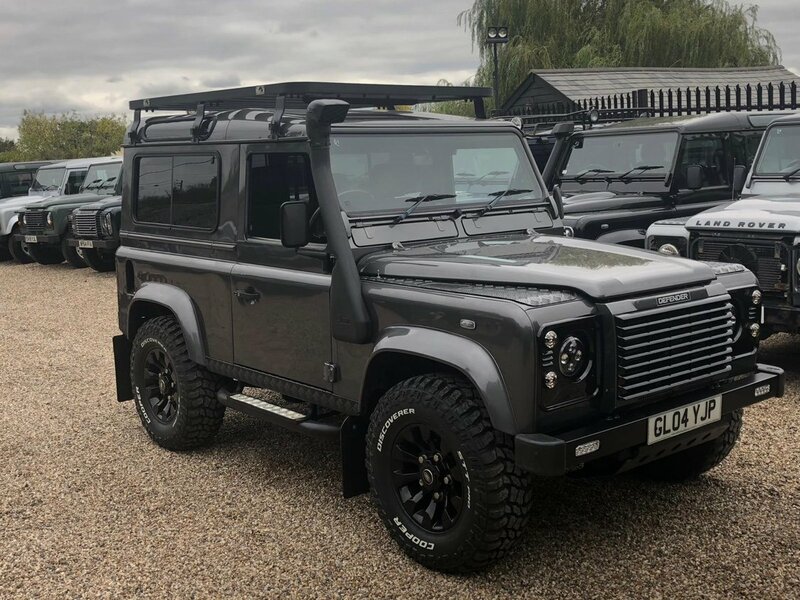 I have managed to acquire ( another story ) one of the last Defender 90 XS produced , which isn’t going anywhere ..... hopefully whilst I’m still on top of the green stuff . Have fun and I shall follow your progress with interest and chip in where I can , however up until now the advice you have been given has been spot on is why I joined this forum . Love her and she will make you smile !! Last edited by Norbert; 10th February 2019 at 21:39. Original paint work. Happy to give you a list of add-ons as mentioned by FFF. Tbh it’s hard not to stop but some are essential to bring them up to date. Being a TD5 also did an ECU remap. Get some protection on underneath. Best investment you can make. Cost effective to get the back converted to standard station wagon. Make it more useable and saleable. Seconded - I bought a 24 litre / 2.5hp compressor and soaked our motorhome and 1997 mini in 3-gallon of waxoyl between the two of them. Get a compressor and a waxoyl gun, and re-apply once a year. A gallon of black Shultz or Finnigans can be found for £23 on Ebay. 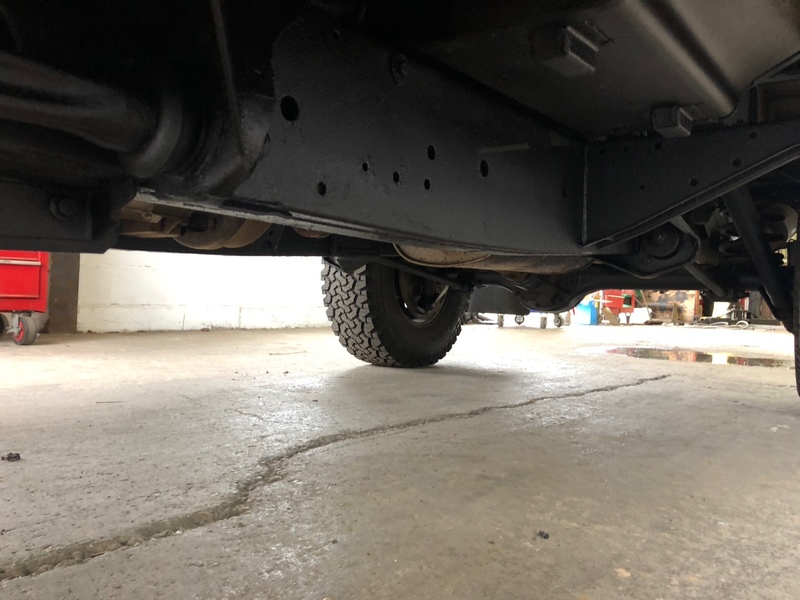 This is one we did recently upgrading the front end and complete chassis wax oil. As been mentioned one of the most important things to get done on these. What size are those boots? Are you putting them on SC? Buy a new fuel filter before firing up the engine again and if possible do an engine oil and filter change as well. That way you are not swirling the crud around from standing so long. 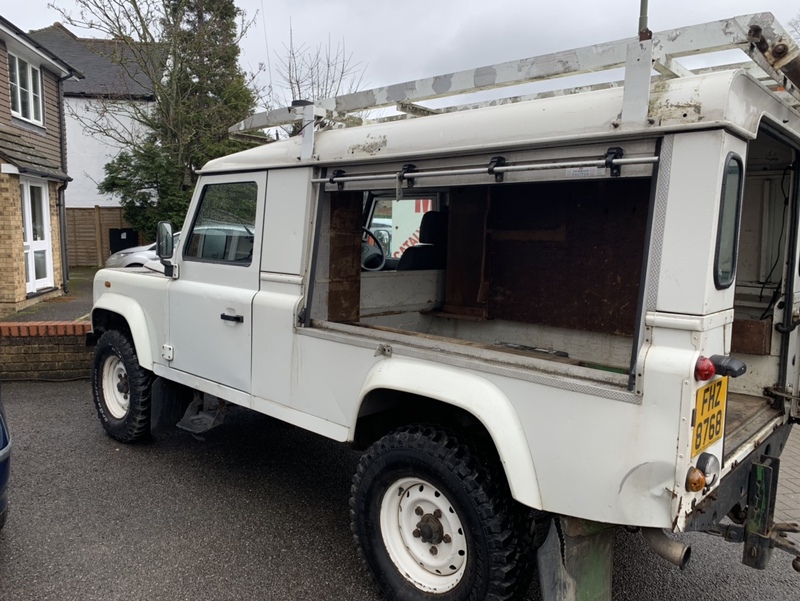 Nice LR and a good find - those rear shutters may work as part of an overland vehicle.